The giant 5-story brick 19th century warehouse on the corner of 18th Street and Main Street will be reduced to two stories by the end of the month. When we visited last time in September, we were puzzled at the slow progress of the demolition and the lack of an intent to demolish sign. It turns out that the city condemned the massive building against the owner’s wishes and the case has been in court for some time. The current owner purchased the building a while back with the understanding that it was “free from all encumbrances” and planned to store items there previously housed in a leased space off Barret Avenue. Shortly after closing on the property, he found out the city had condemned the property as a fire hazard. To appease the city, a sprinkler system was installed but shortly afterwards, several pipes froze and burst causing water to collect in the basement. The sprinklers were fixed, but problems continued. A few bricks began to fall off the top of the building along the alley and the city again pushed for its demolition citing safety concerns. The owner was not able to move into the building and couldn’t move out of his leased space, causing more problems to arise. The property was put on the market, but a buyer could not be found. 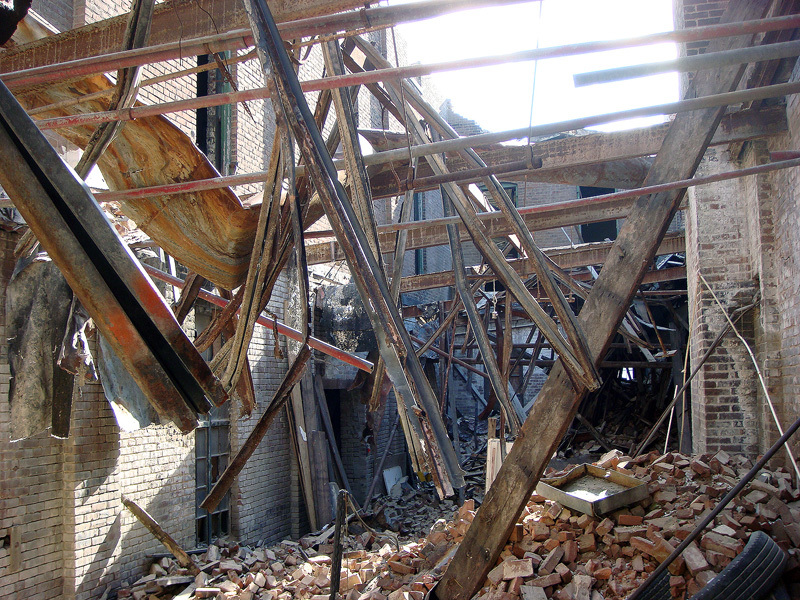 With court costs rising, he agreed to take demolition courses and purchase insurance to tear down the building down and salvage the materials inside. With a previous background in interior remodeling and demolition in his business (Downs Enterprises), the proposal was quite feasible. Asbestos was then found in the building and the city wanted it abated properly, a cost that pushed $170,000. Not able to afford its removal, work on demolition halted and the case went back to court. Eventually an agreement was made and the asbestos removed. Crews got back to work removing bricks by hand and stacking them for salvage. 120+ year-old brick can go for $0.35 each, so the building was essentially financing its own demise. Vandalism set in once the building began to come down. A chain link construction fence was stolen, windows were broken, thousands of dollars of copper went missing, and cars stored inside were riddled with bb’s. The city began pressuring the owner to tear the building down faster, but the salvage operation takes time. Another agreement stipulating the building be razed to the second floor by the end of the month was reached and it looks like the demolition crews will make that deadline. The case remains in court as demolition continues, so the process is far from complete. 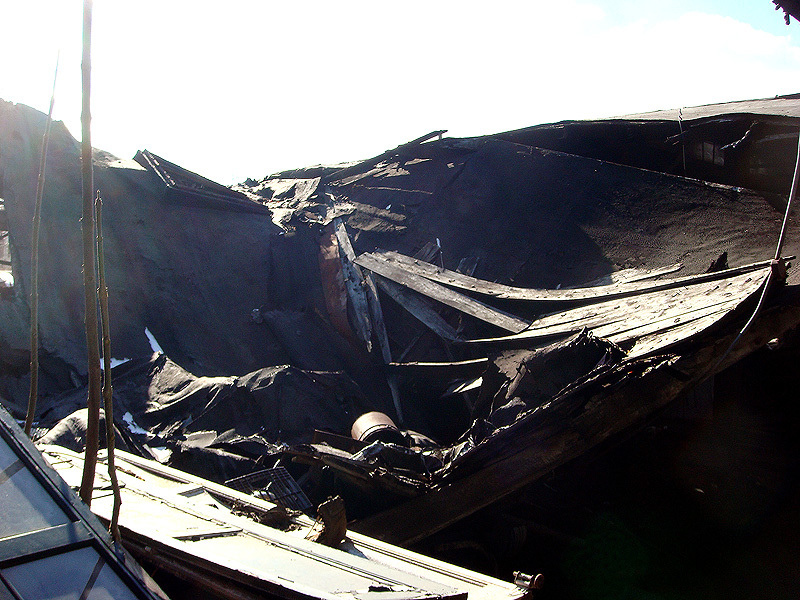 The building, however, is completely destroyed. The building might not have been in all that terrible of condition warranting demolition, though. The massive solid masonry walls were in need of tuck-pointing but were not visibly falling apart or bowing and the owner remembers the roof being in decent shape. Many buildings in town, including some in the heart of downtown, are shedding bricks from their parapets without condemnation orders. The building wasn’t perfect, of course. It needed a lot of work to be turned into anything besides a warehouse, but unless a building topples over, there’s little that can’t be realistically fixed. The owner would have liked to see the building remain standing, content to use the space as a warehouse. This type of massive structure, ranging from three to five stories tall with carved limestone ornaments and moments of ornate brick detail, is exactly what Louisville will need in its urban future for redevelopment. Its really quite close to downtown at 18th Street, but, of course, on the wrong side of the I-64 interchange for any serious redevelopment opportunity now. In time, however, Shippingport, Russell, and Portland, all within walking distance of downtown, will emerge as logical centers of investment. It’s significantly more expensive to build new than to renovate an existing warehouse. And fortunately there are several other large, old warehouses around this area that will hopefully not meet a similar fate. What’s unfortunate it that this building is only a few blocks from the Ouerbacker House that drew so much preservation concern when it faced condemnation, but this much more massive building drew none. This is Portland and Shippingport. 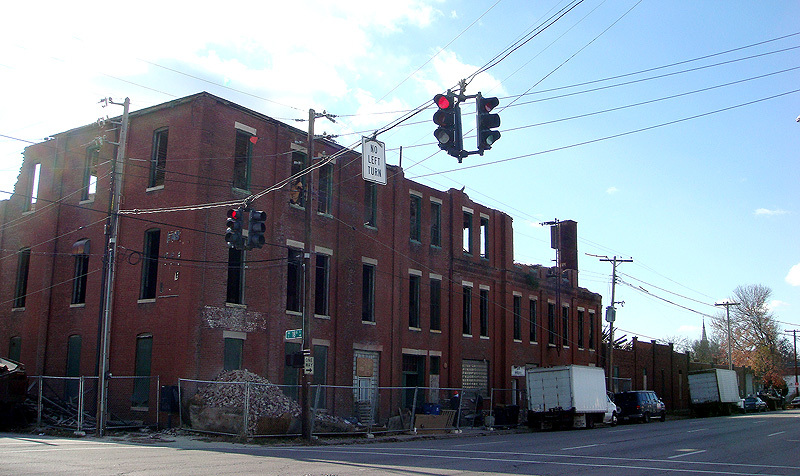 These are Louisville’s natural warehouse districts going back to the beginning. We must be careful not to lose sight of the importance of what might appear “plain” or “ordinary” buildings in our preservation battles. This warehouse should not have had to be torn down. Didnâ€™t know if you would be interested in this, however, we question why the building at 501 East Jefferson Street is being demolished, brick by brick, without the 30-day demolition notice period required for buildings over the age of 65. This building sits on the north-east corner of Jefferson and Jackson Street. There are guys with a pick up truck and a dumpster dismantling the turn of the century building. There is NO demolition permit posted anywhere, NO 30-day notice was posted, they have NO hard hats on, but they are walking around on the second floor in plain sight. We left a message last night with the Landmarks Commission to inquire why no 30-day notice was posted. If you may recall, the 30-day notice posting requirement is what led to Wayside Christian Mission losing our Market Street campus last summer, and now we have no place to move our homeless women and children with the time clock quickly running out. Mr. Jett of the Landmarks Commission called back this morning and left a message that the building had been â€œlosing bricksâ€ since the ice storm, so the City wanted the building taken down on an emergency basis, and that when the City orders it, the 30-day notice period is waived. This doesnâ€™t sit well either, since we had purchased a building in the 700 block of East Market Street in 1999 to expand our services. Shortly after the purchase, there was a large storm and the main structural beam in the building broke. The third floor was sinking into the second floor. The City came out and condemned that building as well, but when we applied for the demolition permit, we were required to post the 30-day notice, even though our building was right on the busy East Market Street corridor with lots of foot traffic and vehicles parked along the curb. Despite the opinion of a structural engineer and despite the safety factors involved with possible loss of life and property, the 30-day notice period was not waived. The 501 E Jefferson Street building is on the corner, with a vacant lot on the other side, with I-65 running along the rear of the building. So without the safety issues we faced, their notice period was waived. If the 30-day notice requirement can be used to so drastically affect peopleâ€™s property, why is it not applied evenly? Or is it just a tool for people to use as they see fit? NEEDLESS DEMOLITION. Some good points made by Ms. Moseley. Folks in the neighborhood and preservation community made efforts to save the structure but were given varying stories by city officials which allowed its destruction – a complete surprise to these groups. I do take issue with this quote however, “…the 30-day notice posting requirement is what led to Wayside Christian Mission losing our Market Street campus last summer…”. If I recall from press accounts, Wayside did not lose a thing but instead MADE a very handsome profit ($5M+) by voluntariy selling their buildings that had been bought on the cheap or donated to them through the years to a private developer who now is investing many more dollars to restore these irreplaceable buildings that Wayside had hoped to demolish. Further, the city, the East Downtown Biz Association and others all supported (and still do) Wayside expanding their campus at Jackson and Jefferson with the windfall realized from the sale plus the millions more that had previously been raised. While I agree that the city’s demolition process is not evenly applied and far from perfect, thank goodness the few protections in place allow folks who realize the higher value of renovation vs. demolition to stop some poorly thought out plans – including the Wayside project which would have destroyed four mid to late 19th century buildings and maybe more in the future. Gee, for a second, thought Wayside was going to support preservation of an historic building, instead, the typical whining and sour grapes that they had to follow the law when they wanted to rip the heart out of East Market…what a bummer law, how unfair. Of course because of that laws waiting period, ended up netting Wayside a BIG pile of cash so looks like a win after all. Oh please. Poor, poor Wayside. How many millions of dollars do you have in the bank now? It is ridiculously disingenuous for Wayside to say "…and now we have no place to move our homeless women and children with the time clock quickly running out." You have at least 14 months left on your current lease in the current facilities. THE TRUTH is that you told all of our government officials that you were delighted to be combining your two operations at your East Jefferson street facility. You said as much at your press conference last June. However, after discovering the old Mercy campus was for sale, you've acted like there is absolutely nowhere else in the universe that Wayside can operate if it is not in the Mercy campus property. Wayside is TOO BIG, with far TOO MANY RESIDENTS and far too large an impact to move into a small, residential neighborhood. Please visit HighlandersForResponsibleGrowth.com to learn more. To comment on Nina's post, the worst thing about that building on Jefferson is that the current Bridges Project has language within it that would have protected this exact building!! Pasta junction would have strung around this, not demo it. Sad, sad, sad. Its about time somebody put that poor building out of its misery.